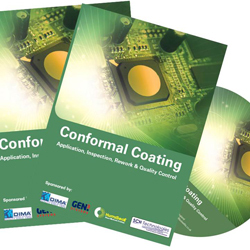 The use of Conformal coating has provided benefits to industry for many years either in the high reliability market sector or where products have to deal with extreme environmental conditions. In recent years, due to changes in technology and miniaturisation, coatings are being used in consumer applications. The use of coatings is seen in different industries like telecommunications, automotive and consumer products which have benefited from the use of selective coating but for different reasons. The CD-ROM provides a simple guide to the use of coatings, their application and process, product benefits, inspection and quality control. A practical defect guide session will also allow delegates to examine coated boards using different materials and inspect the coating application. A unique feature of the CD is a number of engineers answering question on coating processes, process defects and quality control in manufacture.